As many times as I’ve been to New Ulm, I had not yet gone through the cemeteries prior to May this year. 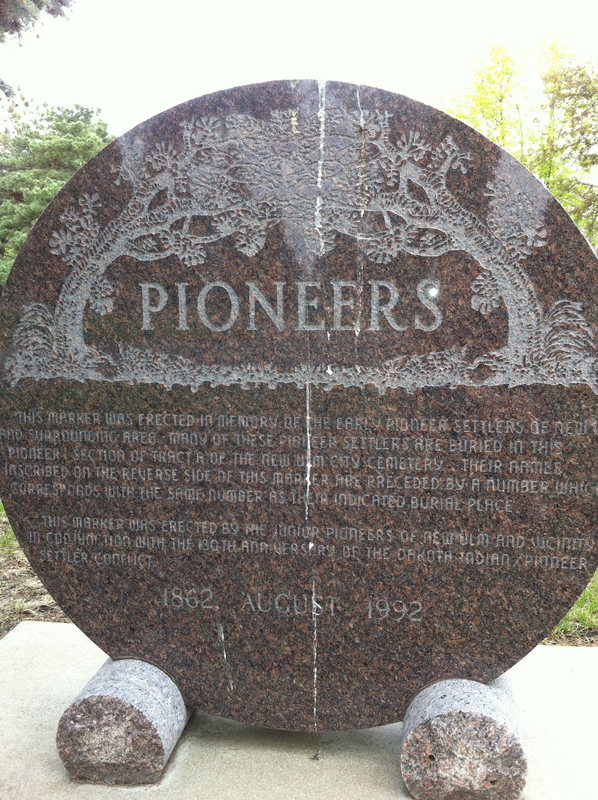 The cemeteries are easy to pass as you’re driving on Highway 14 toward Sleepy Eye, Springfield, and Walnut Grove (the highway is known as the Laura Ingalls Wilder Memorial Highway). But on May 16 I had the opportunity to visit the cemeteries because I was in town for a couple of book readings/talks. New Ulm’s cemeteries are unique in that the city cemetery, the Catholic cemetery and the Lutheran cemetery share the same acreage. You have to read signs carefully to know which one you’re in, signs both directional and symbolic (i.e. crosses on top of the Catholic gravestones). 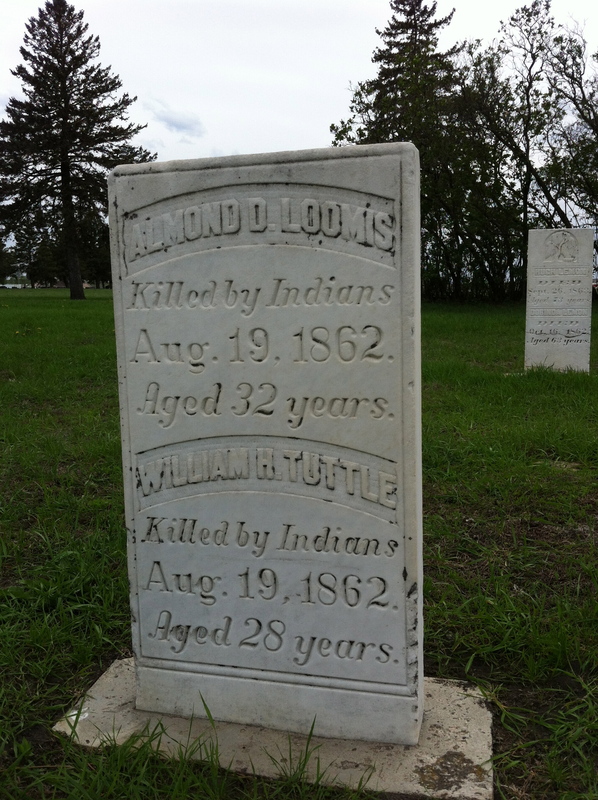 One thing I wanted to look for in the city cemetery were the monuments marking those who lost their lives in the U.S.-Dakota War of 1862. If you didn’t know anything about history, seeing gravestone after gravestone marked with 1862 as a date of death for so many would spur you to learn more. But some of the engravings also tell the story. These gravestones are etched with phrases that might make us cringe today. There might be people who call for the replacement of such markers. But we can’t censor or erase the past. History is uncomfortable—there’s no way to make it always palatable. 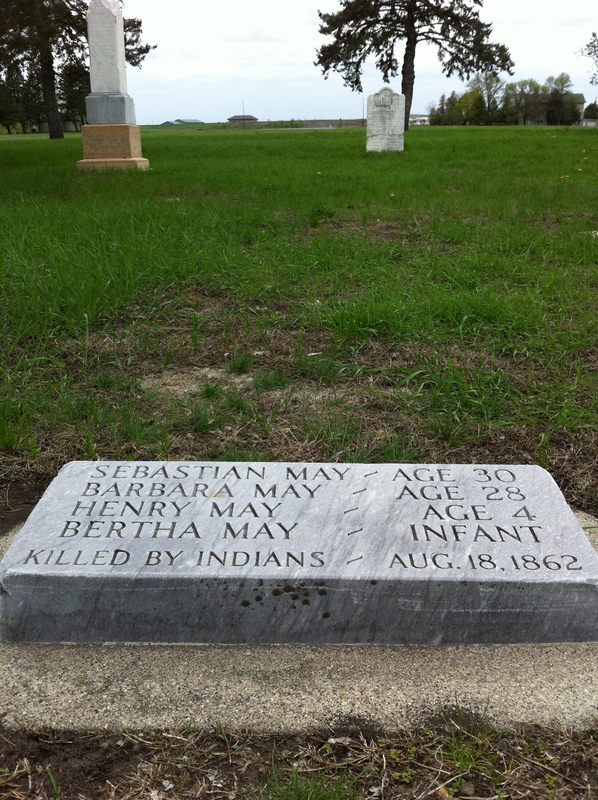 The best we can do is recognize this is one side of the story and ask ourselves, “What made survivors want to include this information on a gravestone?” and “What led to this violence?” We need to put ourselves back into 1862 the best we can to fully understand. The front of the memorial near the 1862 graves. The back of the memorial. Not all of those killed have gravestones. If you go to the cemetery, you might see just a small marker with a number. The numbers correlate to the names listed here. Minnesota Historical Society. The U.S. Dakota War of 1862. Retrieved from http://www.usdakotawar.org/. Gwen Westerman and Bruce White wrote Mni Sota Makoce: The Land of the Dakota, which won a 2013 Minnesota Book Award. Like you, I’ve driven past this cemetery countless times through the decades, but never stopped. 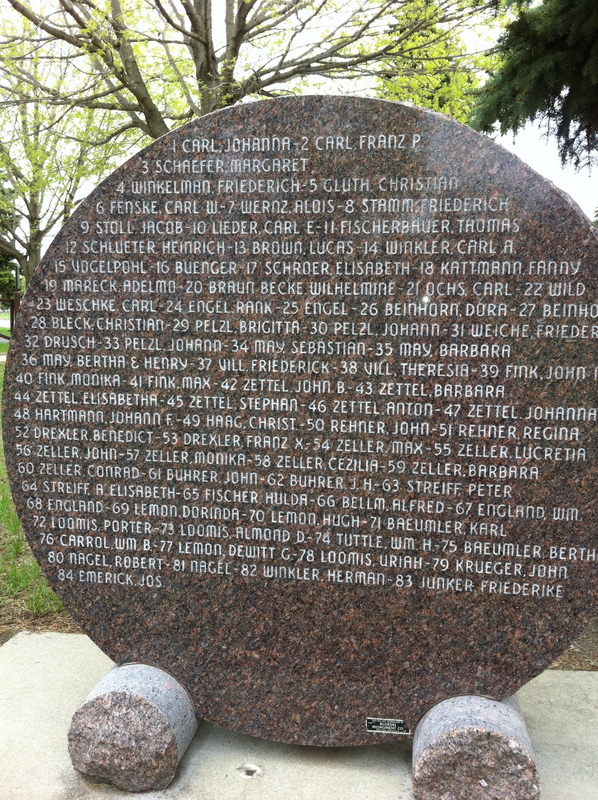 If you take Brown County Road 29, just off Highway 14 by the cemetery, you will eventually reach the Milford Monument, a tribute to the settlers of Milford Township who were killed during the U.S.-Dakota War of 1862. It’s worth the short drive to view. I’ve heard about the Milford Monument, too. I do need to make a trip out there one of these days. 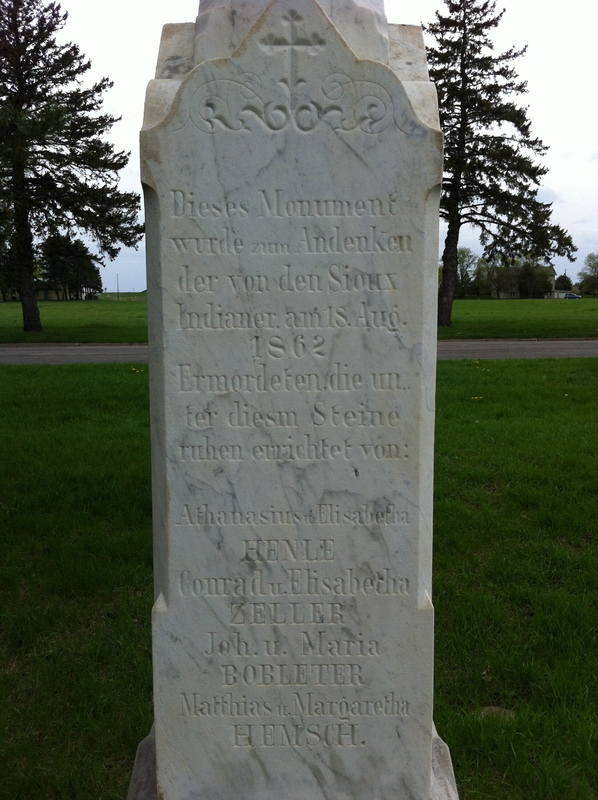 The German stone translates as: This monument was erected in memory of those who are laid to rest under this stone who were murdered by the Sioux Indians on 18.Aug.1862. Athanius and Elisabeth Henle, Conrad and Elisabeth Zeller, Johann and Maria Bobleter, Mattias and Margaretha Hemsch. Thank you! I felt like I could get the general sense but was unsure of a few words.